Oh yes, I said it. 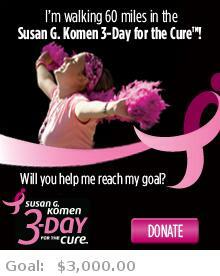 I’m walking in the Susan G. Komen 3-Day for a Cure event in San Francisco on October 1 – 3, 2010. 60 miles in 3 days!!!! I’m totally insane, but this is worth the work. I was looking for a cause and I kept seeing the commercials as I was walking each morning on the treadmill at the gym. And it just clicked. So I attended the Getting Started meeting, signed up, and now I’m registered. This is my chance to do my part in the fight to cure breast cancer!! How exciting, scary, fun, intimidating, exhilarating, and (insert adjective)! I just wanted to stop in and say good luck. I’m going to make sure to follow you.